Adding a VIP to my blog! Yesterday, I blogged about how my husband encourages me to step out of my comfort zone to prepare you for some exciting news. 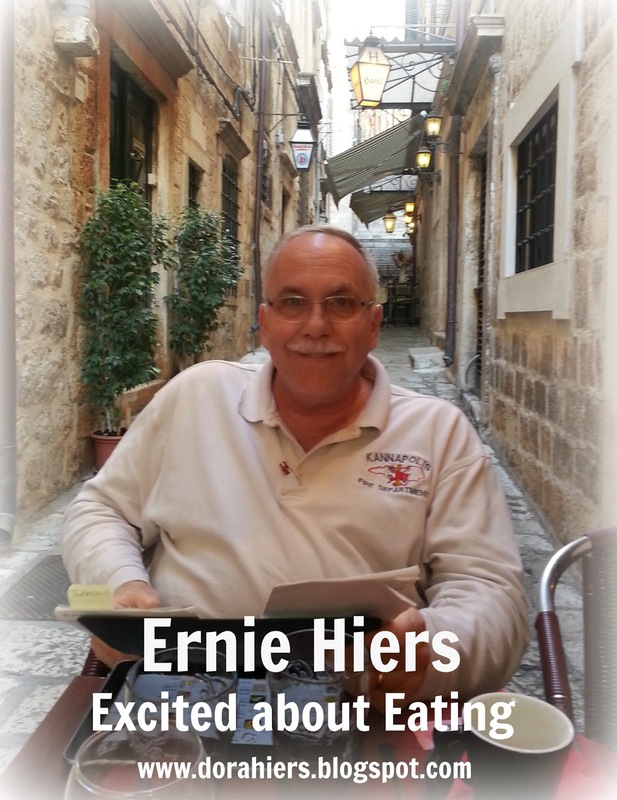 I am THRILLED to announce that my husband, Ernie Hiers, will be contributing to this blog on a regular basis. He’ll be sharing foodie events and adventures along with reviews of eateries in a new series, Excited about Eating, on Saturdays. Journey along with us as we visit eateries around Charlotte and all over the world. With over thirty five years in the fire service, Fire Chief Ernie Hiers looks forward to the next phase of his life, cruising and cooking. Besides being a huge NASCAR fan, Ernie also enjoys judging Kansas City Barbeque Society competitions, smoking barbeque on the back deck, hanging out in a mountain cabin, and his latest hobby…eating through Charlotte. You’ll still find devotionals and book reviews here, but as my writing evolves, so must my blog. In the past I’ve limited my reviews to primarily inspirational romance, but soon I’ll be featuring reviews of other genres as well. My life is so much more than books and writing, and I want this blog to reflect that. And a major shift like this deserves a new name ~ Fiction, Faith and Foodies. Are you excited about this change? Weigh in and let us know! I hope you’ll stick with us and make yourself right at home here. Looking forward to reading more! How fun to have him working along with you! That's wonderful! Thank you, dear friend! My hubby's a load of laughs. Expect we'll have a blast! Thanks Sandy, I am looking forward to this new endeavor. Thanks Ann, I am looking forward to posting. Wonderful idea! I'm looking forward to the “foodie” comments! Thanks, I am looking forward to getting this started. A perfect addition! Welcome, Ernie! I totally agree. Thanks, Myra. Looking forward to seeing you on Saturday. It's been too long! Myra, I think we will wait a couple of months before we declare this “perfect”. Wow, a great addiction, er, um, I mean addition, food reviews!! I loved when I lived in Charlotte many years ago. I can only imagine how it's grown and improved. I think this is a great way to branch out and step out of your comfort zone in a wonderful way! Thanks Robbye, we are looking forward to our first post tomorrow. We've only lived in this area for eight years, but it's grown bunches in that time.